Rockman Corner: New Mega Man Cartoon Retitled as "Mega Man: Fully Charged"
New Mega Man Cartoon Retitled as "Mega Man: Fully Charged"
This month's issue of Licensing Source Book Europe has a small blurb on DHX's upcoming Mega Man animated series. According to the issue (page 62), the series has been renamed to "Mega Man: Fully Charged" and it will make an appearance at this year's licensing expo (May 22-24). The series will reportedly air on Cartoon Network in this US this fall accompanied by a toyline from Jakks Pacific. "Aki Light is a regular, upbeat, robot schoolboy. He lives in the futuristic world of Silicon City, co-inhabited by robots and humans. But this robot boy has a secret... Deep within his programming lie protocols that can transform him into the powerful hero, Mega Man! When the villainous Sgt. Night and his evil team of Robot Masters emerge with ill-intentions, Mega Man dedicates himself to protecting the citizens of Silicon City. Equipped with his Mega Buster arm cannon and the ability to absorb the powers of his opponents, he bravely battles the wickedest of villains. In this brand new series inspired by the iconic Mega Man video game, comical, action-packed adventures abound as we follow the journey of Aki Light and his alter-ego, Mega Man, as he strives to balance life as an ordinary robot boy AND an amazing superhero." Expect to see more from Mega Man: Fully Charged very soon. So the villain isn't dr.wily? I'm still giving it a chance. The synopsis sounds like a fan fiction where they were afraid to use character names besides Megaman. Ugh, that synopsis. Kill me now. I'm kinda hoping that from the synopsis that doesn't mention MegaMini, means that they ditched that. Wily, Robot Masters, "Fan Man," Rush? I know animation takes time, and the switch between 2D and 3D must have taken a significant toll on progress, but three years out and we don't even have an officially-released trailer. It is supposed to premiere this year, right? Why is so little about this series known? The most substantial stuff we've seen has been from leaks and convention promo materials. That being said, I am curious about Sgt. Night as a character, and I hope when we see the final product it's less like a blue-painted Ben 10 than early material suggested it would be. In before cancellation due to "disinterest." How did they make this sound worse then it already was? I will give it a shot but man this just sounds terrible in everyday possible. What happen to the good megaman? They say kb toys may be coming back. Not gonna lie that synopsis isn't sitting with me right but because it is Mega Man I will give it a shot...I just hope I'm not wrong about this but man that synopsis is really dampening on that. Good Lord. Changes are okay, but this doesn't even sound like Mega Man anymore. Sgt.Night? Really? That sounds so generic. This show makes it seem so off brand. Glad they at least added a subtitle. Will make it easier to separate it from the Classic series proper should it not turn out well. I actually approve and appreciate of this name change, as it allows it to be differentiated, as its own thing outside of just "MegaMan". Which, in case it totally bombs, may be a good thing. As its own entity, just like the Dreamwave comic series for example, liberties can be taken and not step on any toes. Glad we're hearing more about it. Once I see this thing in action, I'll be able to take it or leave it. Looks like congratulations are in order for DHX. 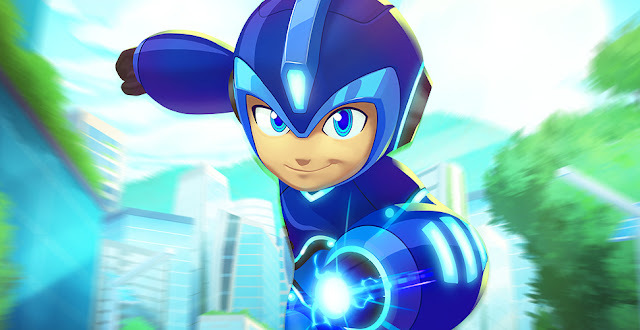 First of all, congratulations on your accomplishment in naming this something other than simply "Mega Man". Adding the subtitle "Fully Charged" is a work of genius as it now prevents confusion with the real Mega Man. Also, congratulations on your success in accomplishing what was deemed the impossible which is making this cartoon sound worse than it already did. Now if you can just replace that pesky "Mega Man" character with something else, then you will succeed once again by making this have absolutely nothing to do with Mega Man and thus make all of us happy. So go out there overachieve, DHX. We believe in you. "Expect to see more from Mega Man: Fully Charged very soon." Even the Ruby Spears Mega Man cartoon got it better than this! No kidding. I've said this a million times but I still believe they have no excuse for taking the direction they did with the series. I'm still kind of upset about it, to be honest. I kind of liked their take on Proto Man. It wasn't perfect but they had a few interesting ideas. I wouldn't have him as my icon if I didn't like him, hehe. The title makes it sound like a sequel to Powered Up. I can always depend on the comments for Megaman news to get my daily dose of pessimism. Where can we send a formal apology to Japan? "Apology?" Lol, this is payback for Japan's Rockman Xover as far as I'm concerned. thinking of it, the premise sound more like Astro boy than MegaMan. with the school and all. It almost feels like they were making an entirely unrelated show and they changed it to a Mega Man cartoon halfway through production while making minimal changes. Now, at the risk of paiting a target on my back - and I would hardly blame you - I say this: Come on Disney, open your eyes and offer Capcom a partnership or something! Your getting Nintendo and Universal get ahead of you! You've been killing it recently as far as animation goes! My theory is that they didn't know Megaman 11 was actually coming, so they expected to use the ol' search engine optimization to get more viewers, same reason the new God of War is just called God of War, likewise the new Tomb Raider and the Ghostbusters Reboot. The intent was to call the show "Megaman" so that people get this stuff right in their faces when they google the franchise. Once Megaman 11 was not only announced, but even looked DECENT (!?) they had to make Man of Action backpedal hard in an attempt to separate the two, because both Megaman 11 and Fully Charged sully each other's image just by existing. Wow, talk about heavy backlash. I don't think I will watch it if they didn't put Elec Man, my all-time fave Robot Master in it. It's ridonkulous how MOA would just take full artistic liberties with the franchise. I mean, I can understand Phoenix Wright's series doing the same. However, this does cross the line...and into a SPIKE PIT of 1-Star ratings by the multitudes.